A standing ovation ended a musically adventurous weekend at Campion Academy, who hosted the Rocky Mountain Conference Music Festival of 2019 that included schools from Kansas, Wyoming, and Colorado. The group of more than 200 students ranged in age from fifth grade to high school with the goal of praising God through music. Led by Curtis Anderson, the rehearsals lasted for two full days. “He was a great conductor and connected well with all the students,” explained senior Christian Carr. One valuable aspect of the music festival is the student mentorship program where each younger student in the orchestra is partnered with an academy student who plays the same instrument during all the rehearsals and during the performance. The more experienced students served as role models for the younger, leading them to a higher level of performance. Esther Aviles, Music Director at Mile High Academy, and Yves Clouzet of Campion Academy conducted the orchestra. Friday, the first night of the festival, featured the Campion Academy Music Department concert, “The Heart of Worship.” Mountain Echoes Chorale, Koinonia, and the Campion Academy orchestra moved the crowd with their inspiring songs and powerful words. But the singing didn’t end there. 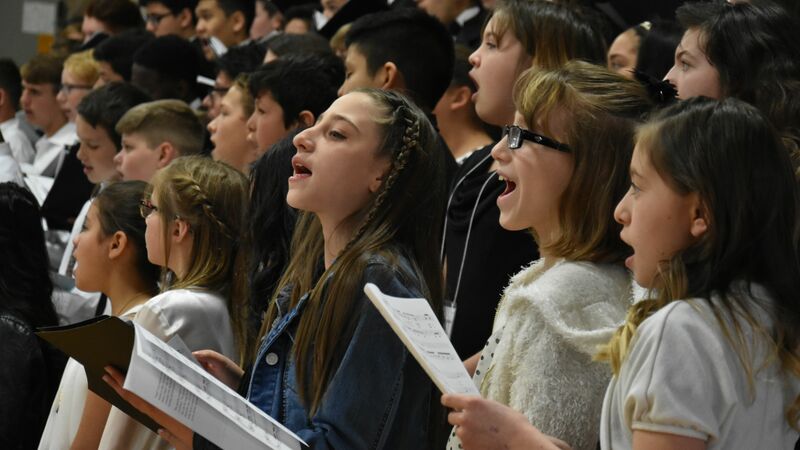 The joint concert for all participating schools was held Saturday and parents and grandparents from all over filled every chair to listen to the students perform. Laughter and cries filled the air as the participants sang one of their favorite songs “Peter Piper,” with Anderson encouraging the young students to let out a bellowing cry to release their emotions during the song. “You could see all the students smile through every song because of how much they thoroughly enjoyed it,” said senior Stephanie Salinas who played in the orchestra. Handbells played passionately as their hands moved to the beat of the songs. "It takes a lot of teamwork and concentration to stay on the beat and listen, but this group pulled it off beautifully," said one observer. Clinician of handbells Miki Shockley worked hard to bring the multiple groups together. The program ended with many thank yous to everyone who took part in making this event possible, including sound coordinators, clinicians, piano players, participants, and many more. Yves Clouzet left the crowd in tears as he thanked his wife for her love and support. He did not forget to mention his daughter and the daughter who will soon come.